Which smartphone maker do you think had the best line-up in 2014? This is it: the very last day of 2014! When it comes to smartphones, there was a lot to see and enjoy throughout the year (not that we were expecting anything else). While there may have not been too many surprises regarding flagships, we’re certain that most - if not all - consumers in need of a new smartphone this year did find something to their liking. As such, we’re curious to know which handset maker’s 2014 portfolio our readers liked best. Sure enough, comparing a small line-up (like Apple’s) to vast portfolios (like Samsung’s, which includes tens of handsets, from the Galaxy S5 and Note 4, to low-end devices like the Galaxy Star 2) may seem a bit weird. But, in some ways, it’s not. After all, it isn’t the sheer number of smartphone models that counts the most, since we usually buy only one, or maybe two handsets per year (or once in a couple of years). So, which one is it? Kindly cast your votes in the poll below! Which smartphone maker do you think had the best product line-up in 2014? LG, Sony, HTC, Samsung, Google and Motorola had the best line-up in 2014. Nokia/MS didn't produce a proper flagship phone, this year. Fanboy gathering of the year! Here we come. yeah it was dishearting, I loved my 1520 so much i got a second one. too bad its over a year old now. WP needs a real flagship. I mean if you can't find a new flagship to buy you could always buy me a 1520 :( ! Moto, even though I'm using a g3. Yeah LAWL @ Microsoft/Nokia. Fanboys, haha. IMO, Sony always have the best line-up. Then HTC, Samsung, LG. Hope Microsoft will make a comeback this 2015 with their Windows 10 for smartphones. Sony have the best lineup always? I dont think so. Maybe most expensive, next to apple! Samsung overall lineup, Motorola. Best single phone, Samsung. 100% agreed. Motorola has stepped their game up. Most impressive lineup from top to bottom. Still picked the Note 4 over the Nexus 6 though. I said the same. Happy that Motorola showed life but the Note 4 is my phone. @PA: please separate Motorola from Google. Motorola had a great line-up for 2014 in my opinion, hitting both ends of the market: high-end with the Moto X, low-end with the Moto E, and the G for everything in-between, at more affordable prices than the competition with the same specs. Though the Moto X probably wasn't the phone of the year, and despite the G and E having a few weaknesses as well, when it comes to the whole lineup, it covers most of the smartphone spectrum with a good bang for your buck for each device. 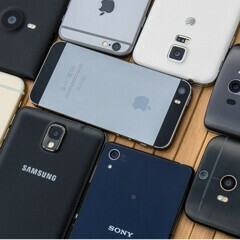 Plus, unlike, say, Samsung's lineup, it isn't cluttered: there's one high-end phone, a mid-range one, and a low-cost one. It's simple, and works well. When it comes to individual phones, LG, Apple and Sony made very good devices; but in my opinion, the strength of Motorola this year is that they had a good phone for every wallet. I completely agree with you, although I'm unlikely to buy a motorola phone, they have a clean, simple lineup for low to high ranges without flooding the market with unneeded phones like Samsung does. Took the words right out of my mouth, well said! It's the best phone of the year. I'm in love with this phone. Why galaxy note 3 is not included! Likely because it was released in 2013. OnePlus! I know it's not a lineup, but it doesn't need a lineup. I miss Meizu. I really enjoyed their line-up of 2014. Best wishes for 2015!